We are delighted to introduce you to Bossom, a really sweet 3 1/2" clown bear made of hand dyed South African mohair, short and tufted in texture in a lovely shade of raspberry pink. His pads and paws are made of black ultrasuede, he has a black stitched nose and shiny black English glass eyes. We have filled Bossom with steel shot for weight, he has a black and dark green ribbon ruff and a black felt hat with dark green stars stitched on it. Bossom is named as part of our Apple varieties collection which is a theme we have returned to as there are still so many great names we haven't used yet. 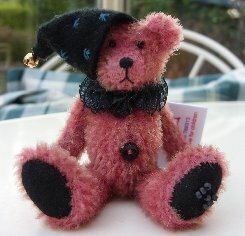 Our clown bears are usually very popular so if Bossom is the boy for you, don't delay too long. He costs £39 plus postage, I do hope that you like him. Please note that as with all our bears, Bossom is not a toy and is not suitable for children. Sorry - Bossom has been adopted.